Sorry my curry lovers....work stuff took over and south east london was denied it weekly curry. 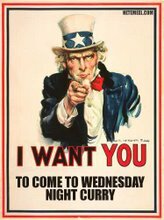 Remember not to forget that you have to remind yourself about the WNCNDSGDP (The Wednesday Night Curry Non Denominational Seasonal Greeting Drinks Party) - Wednesday 19th December - Be there or be shaped like a samosa. Hey! It is such a shame you had to cancel your evening. Perhaps next time you should go along to www.randomcurry.co.uk as they often do random curry nights. Put down the frying pan and come along!